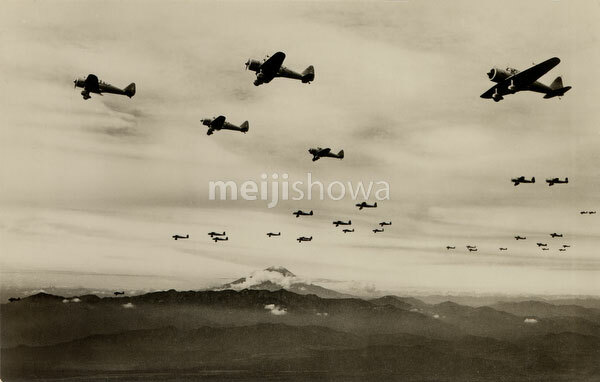 A group of Tachikawa Ki-36 reconnaissance aircraft (九八式直接協同偵察機) of the Imperial Japanese Army (大日本帝国陸軍) fly near Mount Fuji sometime in the early 1940s. The two-seat low-wing monoplane, produced by the Tachikawa Aircraft Company Ltd (立川飛行機株式会) between 1938 (Showa 13) and 1944 (Showa 19), had a single piston engine and a fixed tailwheel-type undercarriage. Because the Ki-36 turned out to be extremely vulnerable when facing fighter planes in the Pacific, it was mainly used in China where it was very successful. By the end of the war, it was used as a kamikaze aircraft. The aircraft was named Ida (アイーダ) in Allied reporting code.